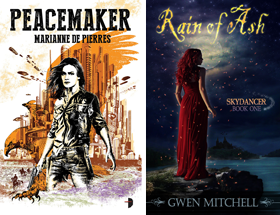 SciFiGuy.ca: I Am Not a Target Market: What Are Men Reading? Bronwyn Kienapple at the wonderful and eclectic blog A Certain Bent Appeal has been running a mini-series of posts called I Am Not a Target Market: What Are Men Reading? (probing the habits of the modern male reader). She suggests (and I share her belief) that there's a special bond between boys and science fiction/fantasy. To date, Bronwyn has had a librarian, an author/critic and a bookseller featured and today you can read my Q&A with Bronwyn on the topic. 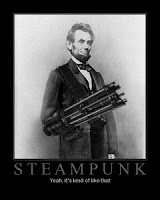 This week is also Steampunk Week over at The Book Smugglers. Dare I say it, but the genre is gaining steam? Today Thea and Ana go in search of a definition for What is Steampunk? They invited lots of blogging folks (including moi) with frock coats and goggles to answer the question. If you've been wondering about Steampunk check it out! Great post thank you so much for sharing the link! I have been following the, "I am not a target market" post(s)for awhile now. You have an excellent blog I enjoy your content. I am passing a blog award onto you that I recently received.